Bricks are sized, in the first instance, by the size of the human hand and the strength of the arm. The bricklayer lifts a brick with one hand, so its width must be small enough to fit between thumb and fingers, somewhere around 4 inches. The length of the brick is then twice the width plus a slight allowance, because before the 20th century solid brick walls were at least two brick widths thick, with some bricks laid endwise and others crosswise to connect the two layers. A brick's weight is limited to what a bricklayer can repeatedly lift easily with one hand, perhaps 12 pounds, though most bricks are half to three-quarters of that weight. Within the weight limit, depth is also limited by the properties of clay; thicker bricks are more difficult to dry and fire. Historically, depth has been the brick dimension that has varied the most. Notice that unfired bricks (adobe) are generally twice as thick as fired brick. Bricks are usually sold in “cubes” of 500 bricks. A cube weighs about a ton. In the United States at least, more than half the cost of bricklaying is labor, not materials. 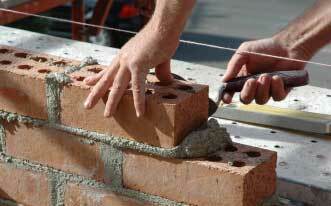 Up to a certain point, a mason can lay more square feet per day if he or she lays larger bricks. Reportedly, cost savings of as much as 50% are possible by using larger-than-usual bricks. Because years of seeing bricks have given viewers a definite if unconscious idea of their size, a wall made of larger-than-normal bricks tends to look smaller than it actually is. Bricks and Brickmaking: A Handbook for Historical Archaeology. University of Idaho Press, 1987.